Our mission is to generate a new therapy or establish novel therapeutic concepts for age-related diseases such as cardiovascular diseases, heart failure and diabetes through the modulation of aging and aging processes. On 24th September 2018 through series of metabolic studies, Ippei Shimizu defined “Senometabolite” as metabolites that promote aging phenotype. Recently, we also identified a protein which icreases in circulation with aging, and I described this as “Senoprotein”. I define “Senocules” as molecules that contributes for the acceleration of aging processes. So far, senocules include senometabolite and senoprotein, however, I consider other molecules including miR would be included in the near future. Here I would like to establish the concept “Senocules induced synchronized aging (sync-aging)”. (Ippei Shimizu, 91st Annual Meeting of the Japanese Biochemistry Society, 24th September, and some other meetings). In addition to the depletion of senescent cells with senolytics, we will try to establish next generation therapy targeting the suppression of senocules. Obese population has dramatically increased in the modern world, and the accompanying diabetic conditions puts a large part of the population at an increased risk of developing a variety of cardiovascular diseases including coronary artery disease, myocardial infarction and stroke. Systemic glucose metabolic dysfunction (systemic insulin resistance and hyperinsulinemia) is known to associate with obesity/ diabetes and heart failure and recent studies reported that it has a central role for accelerating disease processes. Accumulating evidence demonstrate that chronic inflammation in the visceral fat is causal for the development of systemic insulin resistance. The p53 signaling coordinates DNA repair, apoptosis, and cell senescence to preserve genomic stability and prevent tumorigenesis. Its activity is regulated by a wide variety of stress signals, including DNA damage, oxidative stress, and oncogene activation. Recently, the contribution of p53 to many undesirable aspects of aging and age-associated diseases has been reported. 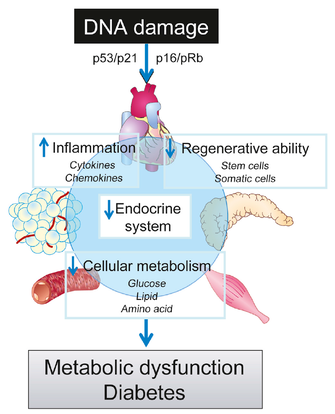 In line with this concept, we found that increased p53 level in the adipose tissue has a pivotal role for adipose inflammation and systemic insulin resistance in the obese model (Nat Med 2009). Recently we have found that in the obese model, secreted-type semaphorine, semaphorine3E(sema3E), locates downstream of p53 signaling and has a chemo-attractant activity for plexinD1 (a specific receptor for sema3E) positive inflammatory macrophages and induce adipose inflammation and systemic metabolic dysfunction. 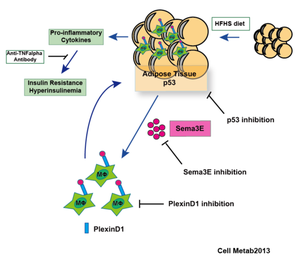 We demonstrated that the inhibition of sema3E-PlexinD1 axis would become the new therapeutic target for obesity and diabetes (Cell Metab2013, Sci Rep2019). We also found p53-induced vascular aging has roles for the progression of pathologies in cardio-metabolic disorders(J Mol Cell Cardiol2015, 2019, PLOS One 2018). Several human studies have shown the close link between heart failure and systemic metabolic dysfunction. Recently we reported that an increase in sympathetic nerve activity lead to p53-induced adipose inflammation and systemic insulin resistance. 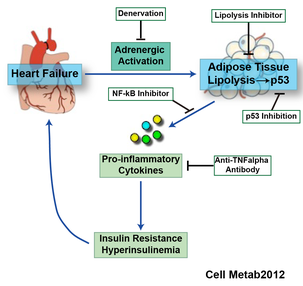 Interestingly, the inhibition of adipose p53 and inflammation ameliorated cardiac dysfunction possibly through the improvement in systemic insulin resistancy (J Clin Invest 2010, Cell Metab 2012). These results suggest that both in obesity and heart failure, the up-regulation of p53 signal in visceral fat has detrimental effects for systemic metabolic function (p53 activation - inflammation - systemic insulin resistance) and has a role for the pathology of these age-related diseases. Brown adipose tissue (BAT) is abundant in newborn humans and small rodents. Recent studies have shown that human adults also possess active brown adipose tissue and it is known to decreases with obesity and aging. In addition to its thermogenic function, it has been suggested that BAT contributes to systemic metabolism due to its high oxidative capacity. 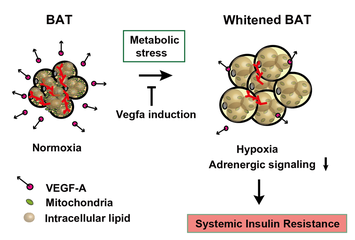 Recently, I and Dr. Walsh (Boston University and Whitaker Cardiovascular Institute) found that obesity causes capillary rarefaction and hypoxia in BAT that is much more robust than in WAT. This condition led to BAT “whitening” that is associated with diminished β-adrenergic signaling, the accumulation of large lipid droplets and mitochondrial dysfunction and loss (J Clin Invest 2014). Scheme showing the mechanism of brown adipose tissue (BAT) whitening. We went further to find other molecules that have causal roles for promoting BAT whitening and functional decline of this organ. 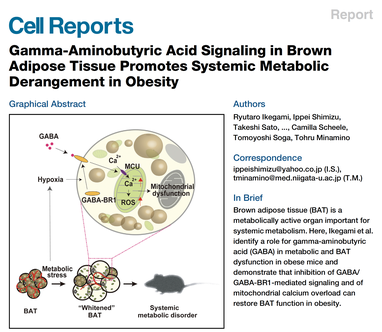 Through collaborative metabolomic studies tested and analyzed by Prof. Soga Tomoyoshi in Keio university, we found that gamma-aminobutyric acid signaling induces BAT dysfunction (Cell Reports 2018). We continue to focus on BAT as an interesting metabolic organ, and now trying to show its roles in age related disorders. We will work further to elucidate the complex biology of senescence and metabolic dysfunction in age associated disease. In 2018 through series of metabolomic studies, I defined “Senometabolite” as metabolites that promotes aging phenotype. Recently, I also identified a protein in plasma of aged individuals. Our preliminary studies indicate that this protein promotes pathological aspects of aging, and now I classify it as “Senoprotein”. By naming these as “Senocules” which contribute for the progression of undesirable aspects of aging, I recently established the concept “Senocule-induced synchronized aging”. In addition to the depletion of senescent cells with senolytics, we are now trying to establish next generation therapies targeting the suppression of senocules. Scheme showing the pathological roles of DNA damage in diabetes. Shimizu I, Minamino T et al.